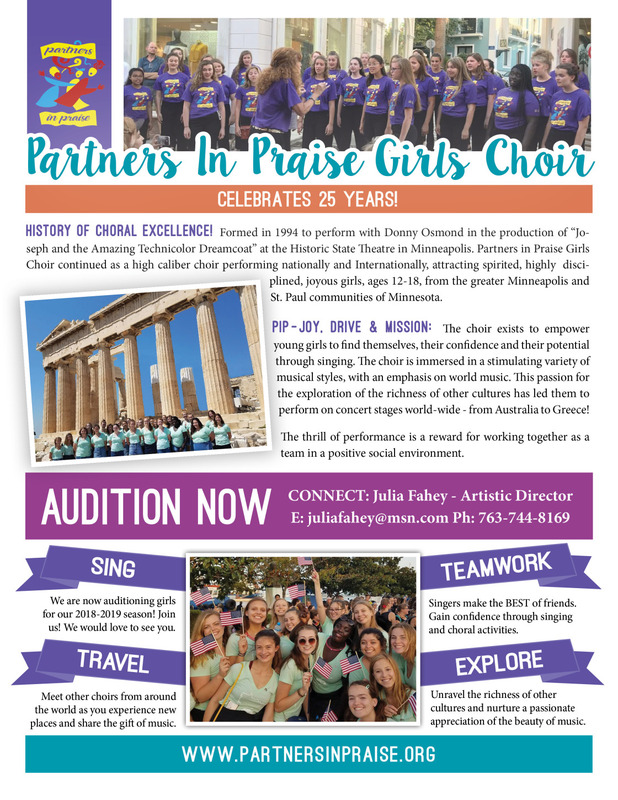 Partners in Praise Girls Choir is made up of girls from 8th to 12th grade from the greater Minneapolis and St. Paul Communities of Minnesota, U.S.A. The choir provides vocal training, music education and performance opportunities in an environment that strives for artistic excellence. All members are immersed in a stimulating variety of musical stylewith a multi-cultural flavor. A major focus of the choir is to explore the richness of other cultures and to nurture a passionate appreciation of the beauty of music. Choir members experience the thrill of performance as a reward for working together as a team in a positive social environment. Interested in joining Partners in Praise? please contact Artistic Director Julia Fahey at 763-744-8169 or [email protected] to set up a vocal audition. We're accepting audtions through September 7th.